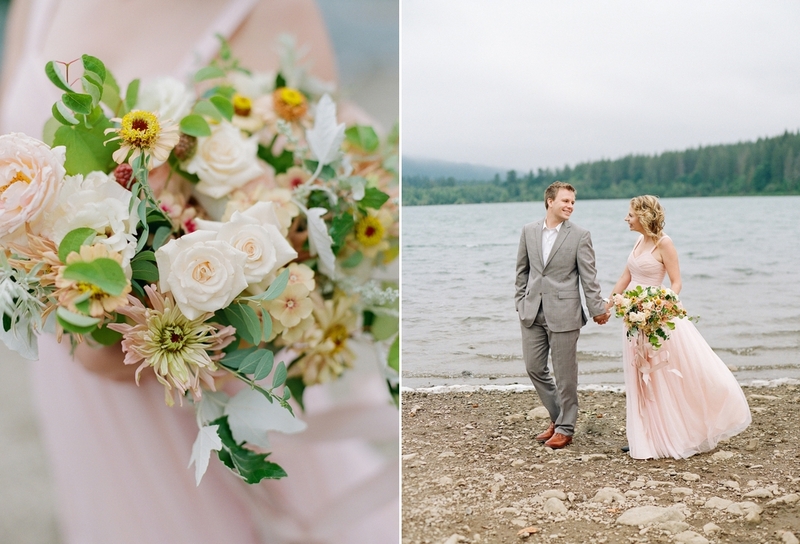 When Sophie Epton contacted me about creating a bouquet for Sarah and Aaron's Rattlesnake Lake engagement session, I couldn't have been more excited! 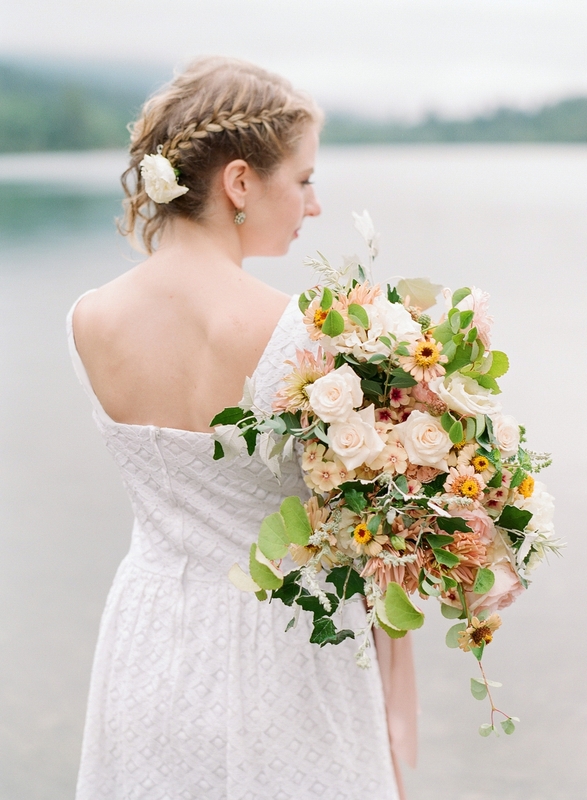 In a soft summer color palette of blush, peach, champagne, and limey greens, this bouquet used all local flowers grown within about a hour of Seattle. 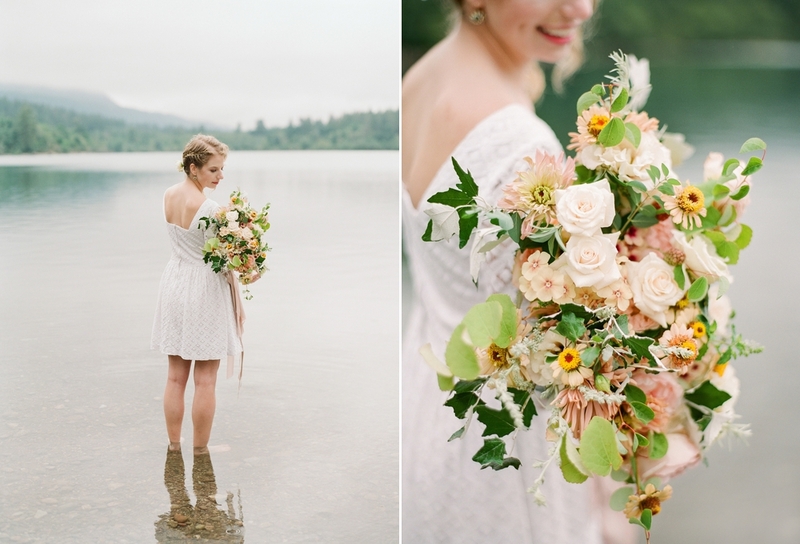 When creating this bouquet, all I knew was the Sarah would be wearing a blush dress. They requested blush flowers to be included in the bouquet, but were also open to using other soft summer pastels as blending colors between the greenery and the flowers. I selected soft peach and champagne as these blending colors. The purpose of having blending colors in any floral arrangement is to create a more sophisticated design and prevent a “polka dot” effect that happens with too much contrast in colors. To help with this, I chose to use limey greens and silver poplar because they are softer in color. The silver poplar has a soft green front of the leaf and, as reflected in its name, a silver underside. My favorite flowers in Sarah’s bouquet are the cute little ‘zinderella’ zinnias. They are the flowers you see with the bright yellow center, surrounded by a tan circle, and then blush petals. They have such a fun feel to them! We used really lovely fully open champagne roses and a couple blush ‘Renee’ garden roses as focal flowers. The Renee garden roses are grown by Peterkort Roses, a local rose farm. They get more and more beautiful as they open and their peachy-blush color starts to fade to a soft barely-there-blush. And the scent! These are some of the most fragrant garden roses I have ever smelled! For smaller texture, I used cherry caramel phlox, which has a lovely golden color with centers that range from blush to cherry to a soft burgundy. The bouquet was finished with hand-dyed silk ribbon. Sophie and Jordan met me at my studio in the Georgetown neighborhood of Seattle to pick up the bouquet and drive it up to Rattlesnake Lake for Sarah and Aaron’s engagement photos. Getting Sophie’s film scans in my inbox was such a treat! Check out the beauty she captured below!